The decision of Kazakhstan’s President Nursultan Nazarbayev to resign will not seriously change anything in the country’s foreign or domestic policy. In fact, the opposite is true: he timed his move in order to preserve as much as possible of what Kazakhstan has achieved so far. Stanislav Pritchin, a research fellow at the Centre for the Study of Central Asia, the Caucasus, Volga and Ural Regions of the RAS Institute of Oriental Studies believes his timing was ideal. Kazakhstan seems to remain firm, both in an economic and a socio-political respect. In recent years, the main factor of uncertainly for the country and its neighbours has been a lack of clarity regarding what the transition of power could look like. The country’s citizens and political elites, as well as its foreign investors and partners feared that if Nursultan Nazarbayev unexpectedly left the political arena, all the republic’s achievements could be called into question due to a highly-possible struggle for power between the main groups of influence. The primary goal of the current changes is to minimise the risks that events will turn out that way. Under the supervision of the former president and through his support, the new president will gradually start handling affairs, gaining experience and political weight. By the time Nazarbayev leaves public office altogether, he will have the opportunity to become the real leader of the republic. Such a course of events perfectly meets both the country’s internal interests and the interests of its external partners. Nobody wants the destabilisation of Kazakhstan. During the transition period, while the first president of Kazakhstan will keep the position of the head of the nation’s Security Council, serious changes or adjustments in the republic’s foreign policy are highly unlikely. Kazakhstan, under its new president, has positive, well-established and constructive relationships with all the major global players, and it is interested in maintaining them. The same is true with regard to its domestic policy: over the next two or three years, no serious changes should be expected. 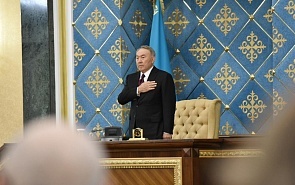 The presence of Nazarbayev in the political arena, although not in the position of head of state, guarantees the maintenance of the current political model. However, it implies the coexistence of the two decision-making centres: the Security Council and the Office of the President. Because of Nazarbayev’s authority, the former is likely to play the leading role. It is difficult to talk about specific persons at the moment. On the one hand, the appointment of the President’s daughter Dariga Nazarbayeva as head of the Senate increases her chances to become the next president. On the other hand, we have to understand that the Speaker of Parliament should play a stabilising role if the head of state unexpectedly leaves his post. In addition, Kassym-Jomart Tokayev, who was recently sworn in as president, could be a provisional leader until the next elections, to be held in 2020. Among other candidates for the post, there are the current ambassador of Kazakhstan in Russia, Imangali Tasmagambetov, the nephew of the head of the republic, the deputy head of the National Security Committee Samat Abish, and the mayor of Almaty Bauyrzhan Baybek. Nevertheless, it is impossible to make any precise predictions.